tasty BBQ flavoured chicken stuffed in sandwich. Boil the chicken in water and half of garlic paste cook till the chicken comes to boil and cooked from inside.shred the chicken and keep aside. In a pan cook tomato ketchup,brown sugar,mustard sauce,garlic paste,honey,lime juice and steak sauce over medium heat. Add salt and ¼ cup water,bring to boil and cook for another 10 mins. Add the shredded chicken into sauce and cook for another 5 mins or till the sauce is soaked in chicken. 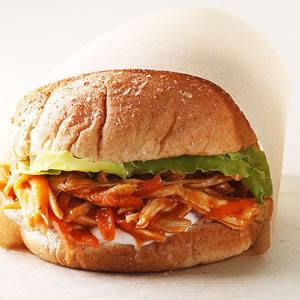 On a bun spread the mayyonaise then spoon BBQ chicken and lettuce leaf put the seond bun over it and serve with chips or french fries. HORRIBLE! I tried this dish and it was too sour. Maybe because of the tomato ketchup, lime juice, mustard sauce and steak sauce. My whole family including my 2 kids, hated it. The whole dish ended up in garbage/trash. I would never make this dish ever again. Thank you! thnx 4 ur comment effat. wow!nice recipe thanks for posting.